Do you have a "form abandonment" widget for Jotform? Do you have a "form abandonment" widget for Jotform? It would be the most awesome widget you could provide. Could you please tell us a bit more on what do you mean by "form abandonment"? I presume that you are talking about a widget that would confirm if the visitors would like to leave from the jotform? I would like to know when someone started to fill out a form but then decided not to complete and submit the form. This should be possible with a Formisimo Conversion Tracking integration on the form. Note, that their service is not free. I will also add your widget idea as a feature request to our system. Unfortunately, I do not know when or if it will be implemented, but we will let you know if we have any updates. Is this now included in the Built in Form Analytics? Yes, it is actually included in the Form Analytics. the checkmark would show the responses while minus - would indicate that the form was abandon. It also shows the IP of the same on the left and the numbers at the top for general numbers on the specific time frame. For example the above shows that there were 36 views of the form in total with 8 responses. 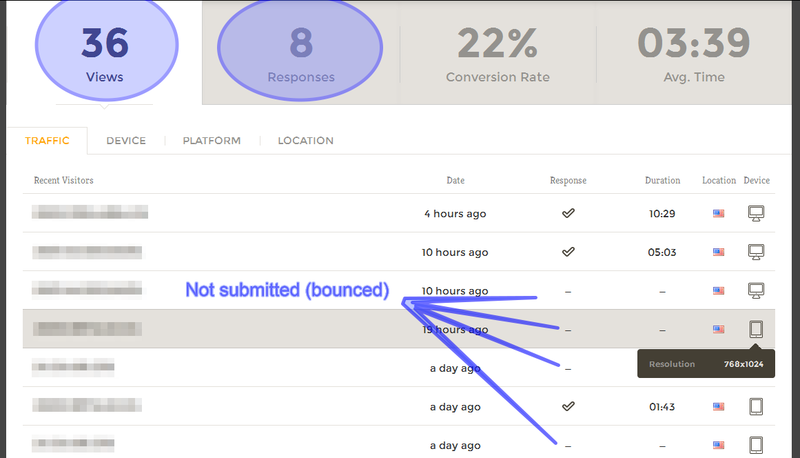 Which means that in the specified timeframe there were 28 people that had abandonment the form - 22% above says that there are 78% of bounce rate - abandonment made (100 - 22%). I have posted this here since this could help the owner of the thread as well, but if you have any further questions @mundellwebmaster, please do open your own thread and we would be happy to answer it.